KOELEN, Marga Th. 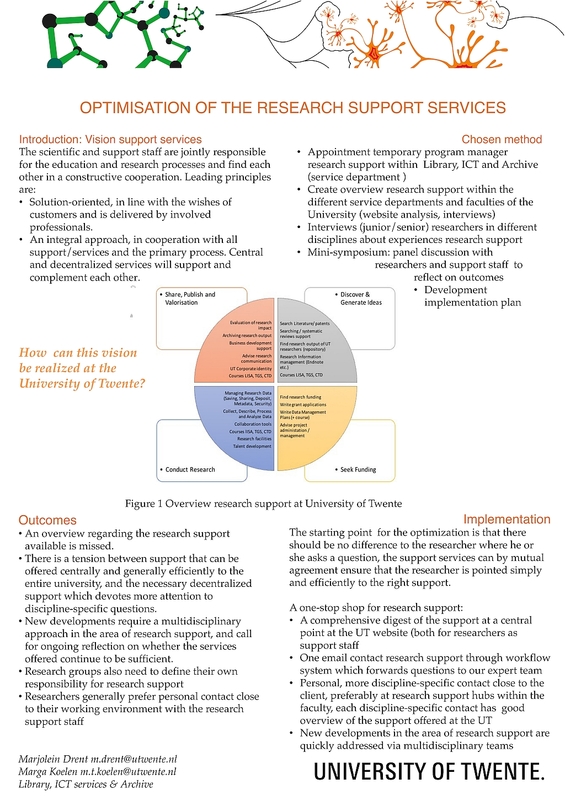 and DRENT, Marjolein (2017) Optimisation of the Research Support Services at the University of Twente The Netherlands. Paper presented at: IFLA WLIC 2017 – Wrocław, Poland – Libraries. Solidarity. Society. in Session 112 - Poster Sessions. Research support entails all support during the entire research process, ranging from support in developing new ideas, projects, and proposals to support in publishing and disseminating the research results, and in commercial knowledge transfer. Several support departments at the university are involved in the research support. Within faculties and institutes, research-supporting services are also offered. 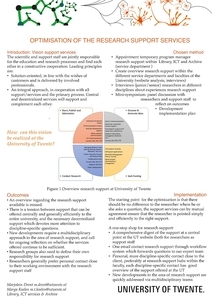 Support departments want their services to be visible for researchers and to match their wishes and needs. Partly for this reason, a joint approach of these services and closer cooperation are important to optimize the research support. This fits well with the vision of high-quality service as stated by the University. The comprehensive delivery of services must be organized in such a way that the scientific staff are optimally relieved of their routine cares, so they can concentrate as much as possible on research and commercial knowledge transfer. Project: A program manager Research Support was appointed for 6 months to develop a vision for comprehensive research support. This program manager started with an inventory of the current services at the university by having interviews with all service departments. After that the researchers in the different faculties were interviewed to listen to their opinion on the current services and their wishes. After all the interviews, a mini symposium was held were service departments and researchers discussed together the outcomes of the project. On the poster, the outcomes of this process will be visualized.